Running is more than just a way to stay in shape for Scott Howse. 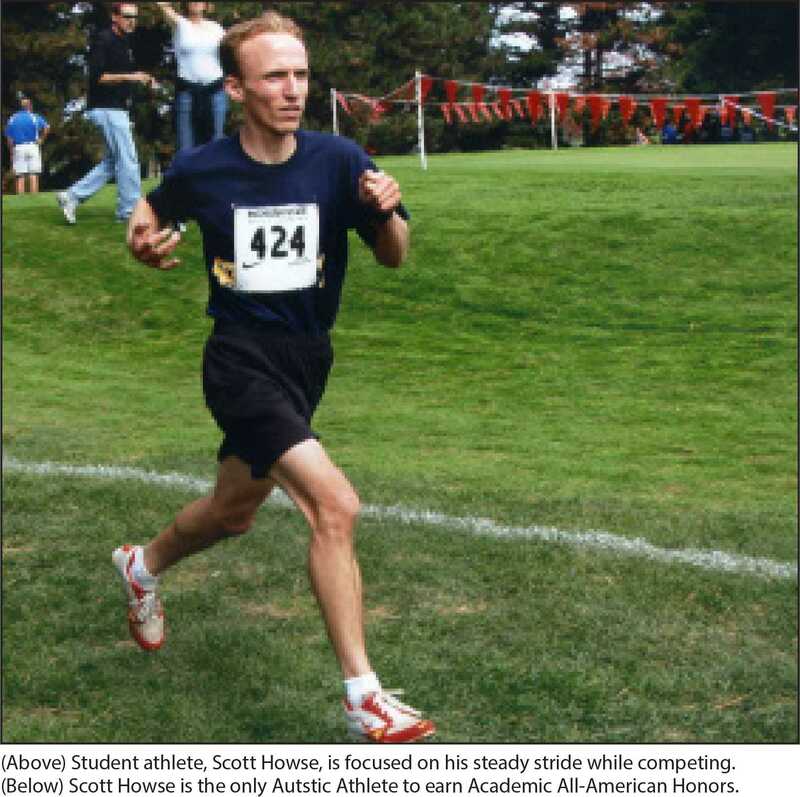 Howse is in his sixth season on the men’s cross country team and is according to Head Coach Ed Kozloff, the only autistic athlete to be recognized for outstanding success in the classroom as an Academic All-American in 2010. Howse’s study skills are one of a kind according to Kozloff. During a trip to the Walt Disney Cross Country Classic in Oct. of 2008, Kozloff recalls Howse taking academic initiative on the flight to Florida. “I got out my math book,” Howse said. Howse started running due to an inspiration from God and a teacher. “God inspired me. It [Cross Country] is a really challenging sport. It was nerve-racking at the start, but at Novi Christian I was inspired by Mrs. [Lucy] Van Meter,” Howse said. At Novi Christian, Howse said that Van Meter calmed him down before running to ease his nerves. “Mrs. Van Meter was funny,” Howse said. For those that do not know Howse, his life has been a remarkable journey. Howse could not walk until he was six-and-a-half. When he was in middle school at Novi Christian he ran competitively despite the challenges the sport provided, something that he always enjoys. In the fall of 2008, Kozloff was hired in as the head cross cross country coach for the Men and Women’s teams at Schoolcraft. The men’s team was making a comeback after the sport was cut more than 20 years ago. In its first year back in 2008, men’s cross country was a non-scholarship team at Schoolcraft, making it difficult to find willing runners. “No one knows why they [Schoolcraft] didn’t have a men’s [cross country] team. But I had to scour the area for cross country men,” Kozloff said. Just before the 2008 season started, Howse’s parents found out about the men’s program that Kozloff was starting back up. With running in the Howse’s blood, it was almost automatic that Scott was encouraged to join the team. Scott’s dad, Ken, was Michigan high school’s state champion in cross country in the mid 1960’s. Howse made quite the first impression on Kozloff as he led the team on one of their first workouts of the 2008 season. Howse is able to compete for Schoolcraft as an “unattached” runner to the team. He practices with the team every day and runs in the same meets as his teammates, but cannot score points for the team. Kozloff loves what Howse brings to the cross county program on an every day basis. Howse appreciates Kozloff and his enthusiasm for cross country. “Coach Kozloff is an awesome coach,” Howse said. Howse is an essential part of the cross country team and Kozloff loves coaching him.